Laughter Yoga was developed by Dr. Madan Kataria, a medical doctor from India. 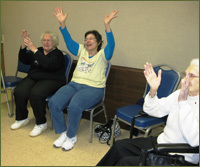 Based on the scientific fact that the body cannot differentiate between real and fake laughter, Laughter Yoga is sweeping the nation and has found a home with Community Partnership on Aging at South Euclid Community Center from 11:00 AM -12:00 PM. Just 10 minute of hearty laughter can be as beneficial as 30 minutes of cardio! Check out the full list of benefits by clicking this link to the Laughter Yoga website, and then stop by the South Euclid Community Center to try the class! Fee is only $2.00 per person per class.